Hoboken, New Jersey -- Where Baseball was Born! 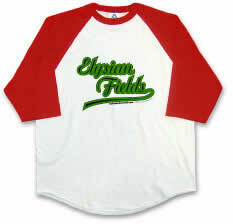 On 19 June 1846, the first officially recorded, organized baseball match was played under Alexander Joy Cartwright's rules on Hoboken's Elysian Fields with the New York Base Ball Club defeating the Knickerbockers 23-1. Cartwright umpired. 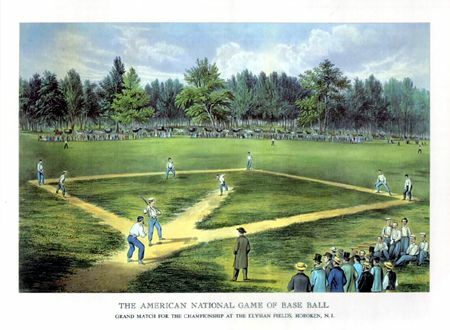 In the Harper's Weekly of 15 October 1859, a spread was devoted to two games being played on Hoboken's Elysian Fields. Across the top was an image of a cricket match. Across the bottom was this image of a baseball game. 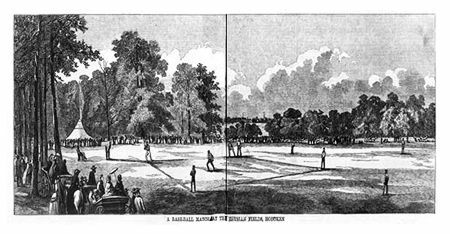 On 3 August 1865, almost twenty years after that first game, 20,000 people attended the rain-shortened 5 inning championship game between the Mutual Club of Manhattan and the Atlantic Club of Brooklyn on the same spot. The Atlantics won 13-12, and the event was depicted on a Currier & Ives print in 1866. "From time to time over the years, various critics have challenged the speculation on Doubleday, although most of the original documentation was lost in a fire in 1916. Abner Graves' credibility as a reliable witness has been questioned and Doubleday's diaries, surprisingly, made no mention of baseball. Some argue that Doubleday was not away from West Point at all in 1839; and to further complicate the situation, still others claim that there were two Abner Doubledays. Many of these contradictory theories have been well-documented by their proponents. Whatever may or may not be proved in the future concerning Baseball's true origin is in many respects irrelevant at this time. If baseball was not actually first played here in Cooperstown by Doubleday in 1839, it undoubtedly originated about that time in a similar rural atmosphere. The Hall of Fame is in Cooperstown to stay; and at the very least, the village is certainly an acceptable symbolic site for the game's origin." I originally included the words "Birthplace of Baseball" in this site's designs, both on the merchandise and the banners. But then, thanks to the searchable databases of the US Government's Patent & Trademark Office, I discovered that the Cooperstown folk have those words trademarked for a number of uses. They filed it in May 1995, the USPTO published it for Opposition 18 June 1996 (Almost 150 years to the date after the first organized game in Hoboken! ), and the mark was granted in August of 1998. So, I opted for "Where Baseball was Born", instead. We're selling all kinds of goodies (t-shirts, sweatshirts, coffee mugs and mousepads) with our designs celebrating Hoboken's place in baseball history in our little store. I expect to be adding to the site as time goes on. For more history, check some of the sites on our Links page. Developed, Hosted and Maintained by Randolph Hoppe of R+Y Communications. Website ©2001-2006 R+Y Communications. All rights reserved.